Currency substitution occurs when an economy uses an alternative currency to the domestic currency. The alternative currency maybe used in parallel to the domestic currency or some cases may completely replace it. Currency substitution can also be referred to as ‘dollarisation’ when the dollar is used. Usually, this will involve using an internationally recognised major currency like the dollar or Euro. For example, Zimbabwe used the American Dollar after a period of hyperinflation. Author Crosswords. – wiki – licensed under Creative Commons Attribution-Share Alike 3.0 Unported license. Currency substitution can be ‘official’ policy as in the case of Panama. However, it can also become a partial substitution due to unofficial reasons. Rampant inflation causing the domestic currency to become worthless and people lose confidence. The higher and more erratic domestic inflation is – the more unofficial currency substitution will occur. During capital flight, a foreign currency holds its value better. A dollar can become a store of wealth. Dollars may be needed to buy certain inputs from other countries. A country may adopt official currency substitution as a policy to deal with inflation that has got out of control. Provides a means to deal with inflation – the government cannot print foreign currency to create inflationary pressures. This provides an incentive to deal with inflationary pressures – such as cost-push factors and supply constraints. The government cannot print money to finance a deficit and this creates an incentive to tackle overspending. Currency substitution has been effective in keeping inflation lower in countries such as Zimbabwe, Ecuador and El Salvador who have undergone currency substitution. Low inflation, in turn, encourages more bank lending and business investment. Reduces transaction costs. A substitute currency like the dollar creates the ability for frictionless trade and investment between the US and developing economies. Many small European economies use the Euro for similar reasons – it is not worth the costs of managing a currency – Andorra, San Marino and Lichtenstein. Stability. WIth a foreign currency, the economy is unlikely to face a balance of payments crisis, when speculators take flight and sell domestic currency. Loss of lender of last resort. With using full currency substitution, a Central Bank cannot print foreign money to act as lender of last resort – e.g. provide liquidity when selling government bonds. This can increase uncertainty and lead to higher bond yields in times of poor liquidity. To some extent, it can be dealt with if international bodies agree to lend money if necessary. Inequality. The process of currency substitution could wipe out the savings of domestic savers who have been saving in the local currency. Those who can save their assets in dollar assets may be those with more significant economic power. However, countries often move to currency substitution precisely because they have liquidity problems and struggle to provide certainty for the banking system. Loss of exchange rate flexibility. 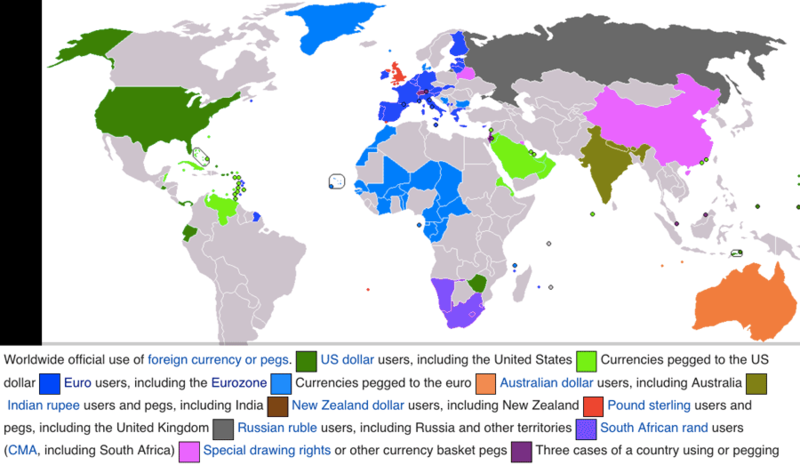 Using another currency means the exchange rate is dependent on the dollar. This provides greater certainty. However, it could cause exports to become uncompetitive if the dollar appreciates, but the local economy faces rising costs. In this case, the country loses the ability to effectively devalue the currency to restore competitiveness. This over-valuation of the currency can lead to a fall in exports and limit economic growth. Rounding up. When official dollarisation occurs, business have to change prices into dollars – it is argued this gives business an opportunity to ’round-up’ prices into the new currency. This can affect the poorest who see rising prices but not rising wages. Hard to go back. Once the dollar is established in an economy, it is hard to go back to a domestic currency because there will inevitably greater trust and desire to hold dollars rather than the new untried domestic currency.